What was first reported as an injury auto accident, near S.E. 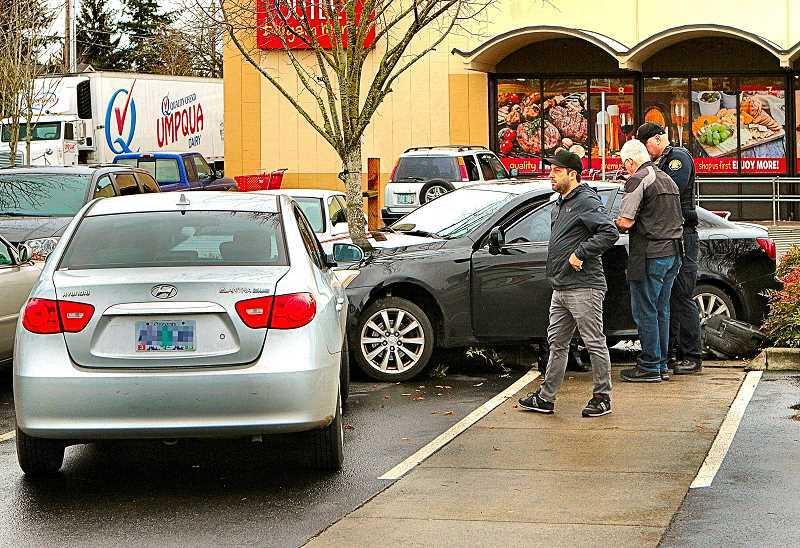 71st Avenue and Flavel on January 3 at 11:45 a.m., turned out instead to be a collision in the parking lot of the Brentwood-Darlington "Grocery Outlet Bargain Market" store. An East Precinct officer at the scene told THE BEE that a woman driving a Lexus IS 250 had apparently pressed the accelerator, instead of the brake pedal, while parking – causing the car to drive up over a concrete parking barrier, across a walkway in the middle of the parking lot, and to collide with a parked car. "Paramedics said the driver of the car was uninjured; the owner of the struck vehicle was shopping in the store, but his dog was in the car when the accident took place," the officer reported. Happily, although startled, the animated dog appeared to be unhurt – once its owner had arrived back to provide reassurance after the frightening incident.